Villa Cornaro, located in the village of Piombino Dese about 30km from Venice, is a masterwork of Palladio's middle period. One American writer recently included it on his list of 10 of the world's most important buildings ("Top Ten Buildings," Town & Country, January 2003). Constructed in 1552-3 for Giorgio Cornaro, younger son of a wealthy Venetian family, Villa Cornaro introduced to Western architecture the two-story projecting portico-loggia motif. Palladio's device influenced Western architecture for hundreds of years, becoming a recurrent feature in Georgian, Adam and Colonial American architecture. The impact of the motif can be ascribed to two primary factors. First, it anticipated the change in the concept of residences, away from the fortress and toward comfort, function, and interaction with surroundings. Second, the double portico-loggia motif was striking, flexible and subject to infinite elaboration and permutation by subsequent generations of architects. Among those utilizing the device was Thomas Jefferson, who selected Villa Cornaro as his initial model for Monticello. Equally important, however, is the exquisite harmony of the Villa's interior spaces. The living area of the Villa's central core forms a square within which are arranged six repetitions of an elegant standard module. 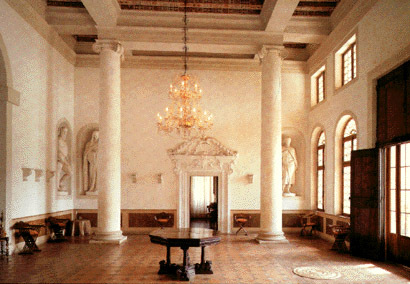 The module, exemplified by the two rooms to the left and right of the entrance hall, is 16 Trevisan feet in width by 27 Trevisan feet in length, creating a ratio of 6 to 10, the "perfect" numbers of Renaissance architecture. The sum of those numbers was deemed "most perfect" and, as indicated, was used by Palladio as the width of the module. 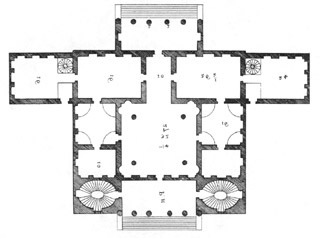 Palladio repeated the module on the east and west sides of the Villa, where the module is divided into a square room of 16 x 16 feet and a smaller room beyond. The central grand salon comprises two of the modules placed side by side. The 9-room floor plan of the piano nobile is exactly repeated in a second piano nobile above, with four mezzanine rooms between. The Villa is unique among extant Palladian works for the extent of its original tile and terrazzo floors and original exterior intonaco (the stucco-like material covering the brick substructure of Palladio's country villas). The south facade bears graffiti recording Cornaro family births in the 1600s, numerous family deaths and honors, and a note from a cousin recording his 1690 flight to Piombino from Venice to avoid "contagion." In 1588 the son of the Villa's original patron commissioned the six statues by Camillo Mariani that decorate the grand salon. The statues, which fill niches that were part of Palladio's original design, represent an innovation in Renaissance sculpture: a private family portrait gallery with full-figure statues of prominent members instead of mere busts. The family pantheon includes Doge Marco Cornaro and Caterina Cornaro, Queen of Cyprus. 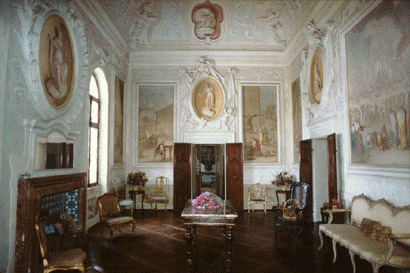 The walls of Villa Cornaro remained in white for many years to accommodate the magnificent painting collection of the early owners. In 1716 Andrea Cornaro, the great great grandson of Giorgio Cornaro, launched a new decorative program. He commissioned Mattia Bortoloni, a young student of Antonio Balestra, to execute a large cycle of 104 fresco panels within a system of stucco putti and frames created by Bortolo Cabianca of Venice. The frescos in six rooms of the piano nobile feature scenes from the Old Testament; in two rooms of the second floor the frescos depict New Testament scenes. The Biblical theme and the specific subjects of the individual frescos were designated by Andrea Cornaro himself. Bortoloni, then 21 years old, utilized the newly evolving "light manner," one of the first extensive fresco demonstrations of that style in the Veneto. The subjects of the frescos appear to have been selected to portray themes of freemasonry, a conclusion strengthened by the apparent use of Masonic symbols in the frescos on the eastern walls of the principal frescoed rooms. Thus the frescos may be one of the earliest examples of Masonic art in Italy. Villa Cornaro remained in the Cornaro family for 253 years, then passed through three other families as a private residence until 1951. After a difficult period in the 1950s and 60s when it was used as a parochial kindergarten and then stood vacant, Villa Cornaro returned to private ownership in 1969 and was restored over a period of 20 years by Mr. and Mrs. Richard H. Rush of Greenwich, Connecticut USA. 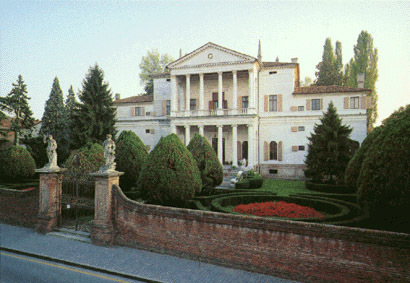 Since 1989 Villa Cornaro has been the spring and autumn residence of Mr. and Mrs. Carl I. Gable of Atlanta, Georgia, USA, the sixth family to occupy the villa in its 450-year history. 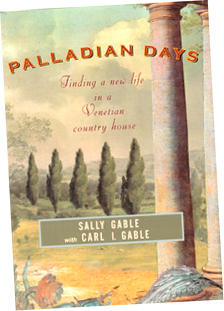 They recount their experiences in their book Palladian Days: Finding a new life in a Venetian country house (Knopf, 2005; Anchor, 2006). Location: Piombino Dese (Padua District). Accessible by car or train. Piombino Dese is 30km northwest of Venice (about 45 minutes by car or train). The villa is two blocks from the Piombino Dese train station. (May-September only) Saturday 3:30-6:00 p. m.